It was surprisingly sunny when we set off this morning. Wharton's Lock was already set for us. 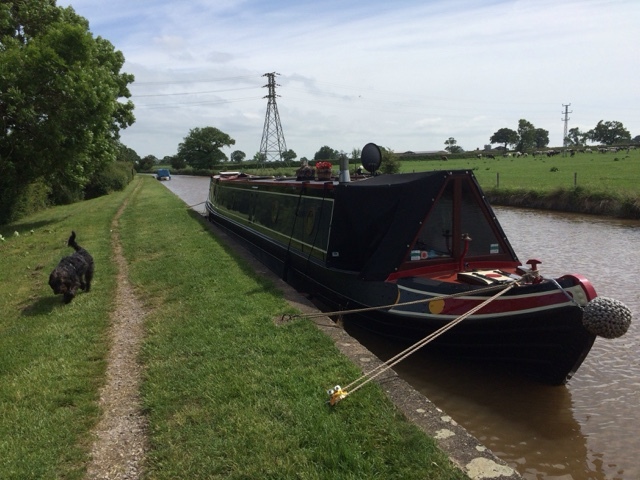 The mooring above the lock was really peaceful, with a wide grassy towpath, great views towards Beeston Castle, and a picturesque setting with the lock and bridge in the foreground. 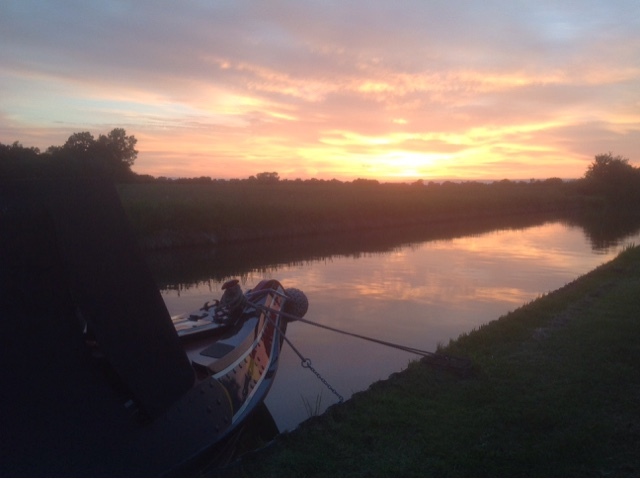 For these reasons, this mooring is now one of our top five spots so far. 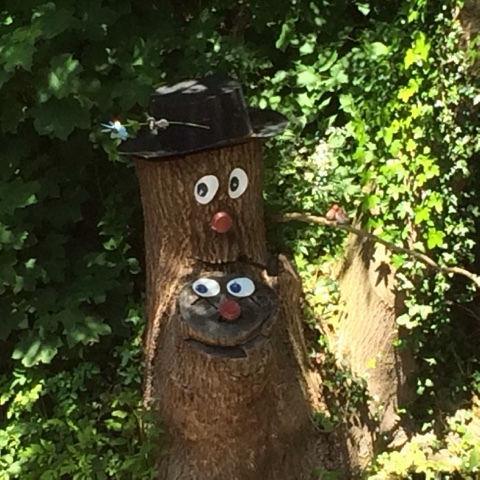 We passed the Shady Oak P.H. 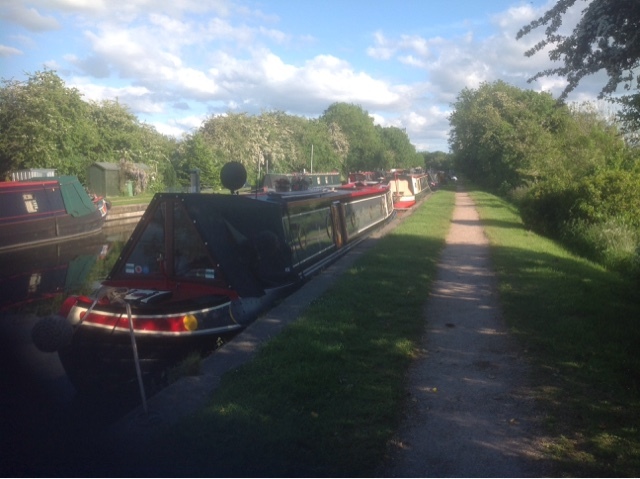 I am sure we will visit again, and then a little under an hour later we pulled into Tattenhall Marina. The winds were only light so manoeuvring was easy but they did have a helpful windsock to aid with direction. We kept a lookout for fellow bloggers on nb Amyjo, saw the boat, but did not see the crew. Their blog can be found in my blog list at the side. 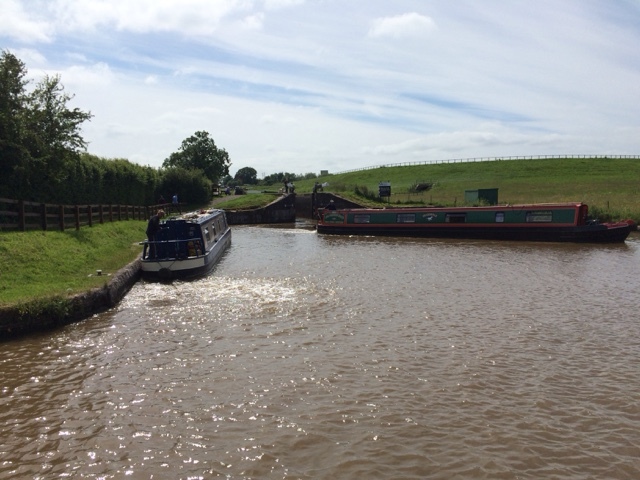 Departing Tattenhall, we very soon arrived at the start of the much talked about, two miles of on line moorings, requiring us to reduce speed from a normal very slow, to an almost stop as we travelled along on tickover. We arrived at Egg Bridge, our planned stopping location but did not fancy it, so on we went eventually finding a spot about 200 yards prior to the Cheshire Cat P.H. We made several attempts to moor finding it extremely shallow along this stretch but eventually we got into the edge, almost. Mooring tyres deployed and pins driven in, this is us now until after the weekend, as we have a wedding to attend. Fingers crossed for good weather. Not too bad at the front end, but the back requires a leap. 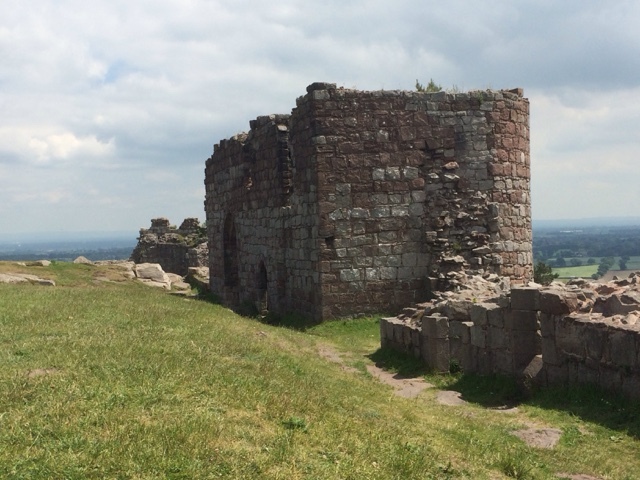 As planned we set off this morning on our excursion to Beeston Castle. 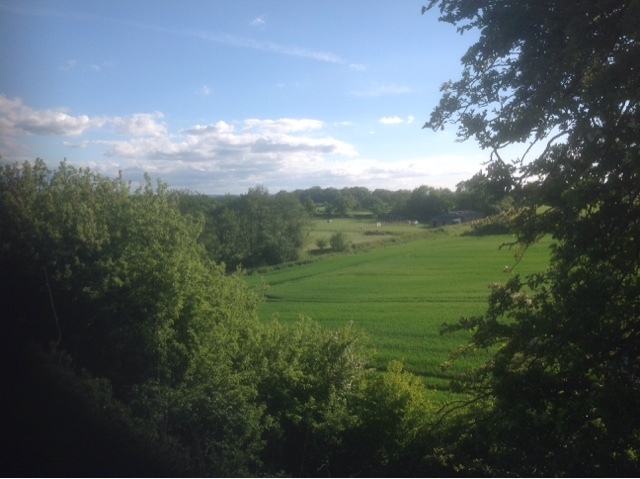 The walk began with a fairly gentle slope upwards from the canal towards the village of Beeston, increasing in gradient the closer we got. On reaching the castle we had a quick drink at the cafe outside the perimeter wall, before we commenced the really steep climb to the top. 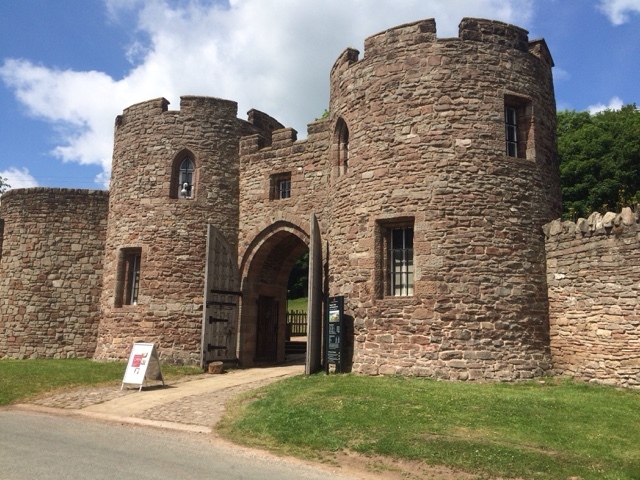 Entrance to Beeston Castle grounds managed by English Heritage. 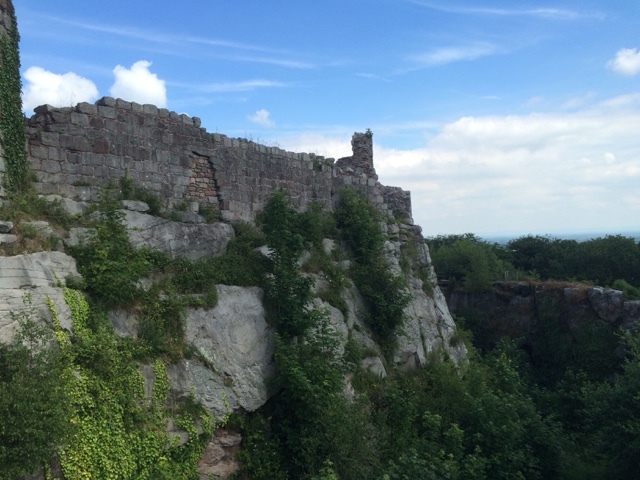 Beeston Castle was built circa 1220 following the crusades. 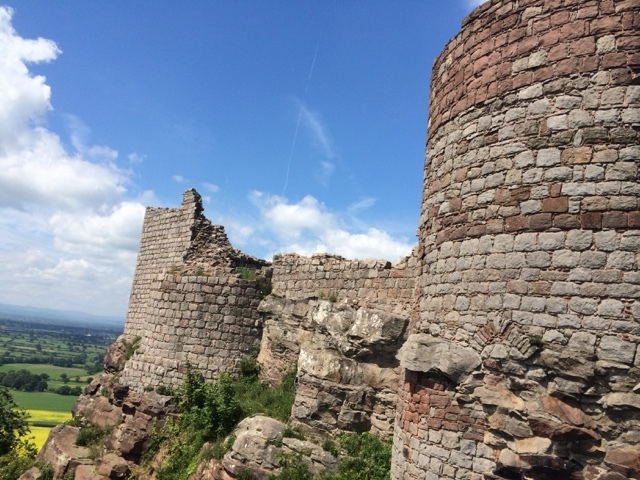 It remained complete as a castle and played a role during the English civil war, until it was partially demolished on the instructions of Oliver Cromwell to prevent further use as a stronghold. 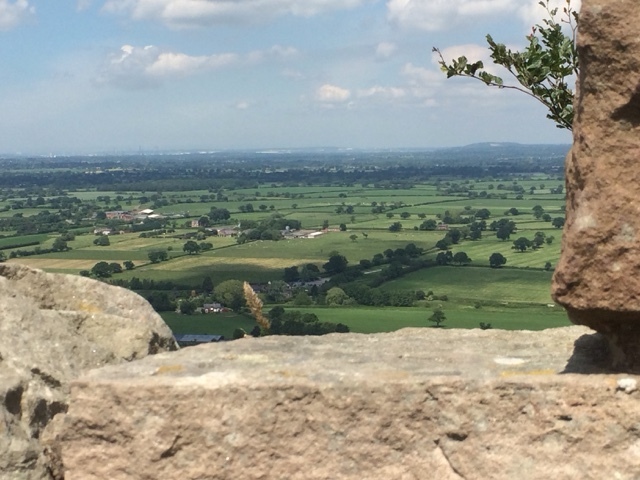 Views across the Cheshire Plain towards Chester 10 miles away. 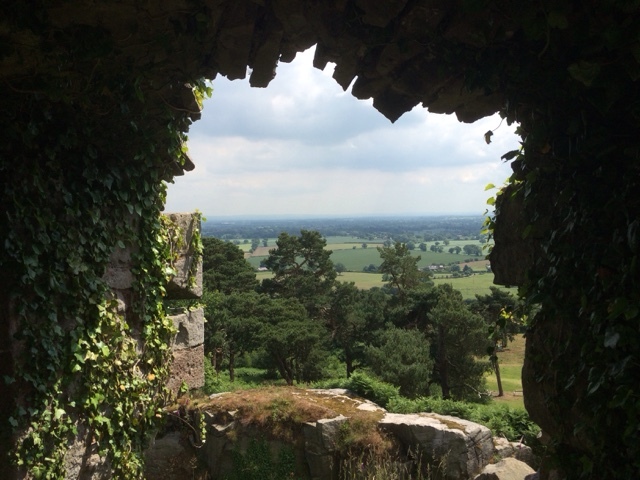 Looking towards the Welsh Hills on the horizon. As can be seen in some of the photos, today we had lots of blue sky and plenty of sunshine. The walk back to the boat had two substantial benefits. Firstly it was all downhill. Secondly the route back took us past the Shady Oak P.H. a venue we had visited before so we popped in again, this time for a late lunch. Looking back at the castle from the Shady Oak. It was then a slow stroll back along the towpath and a pleasant afternoon watching the boat traffic from the Middlewich Festival pass by. 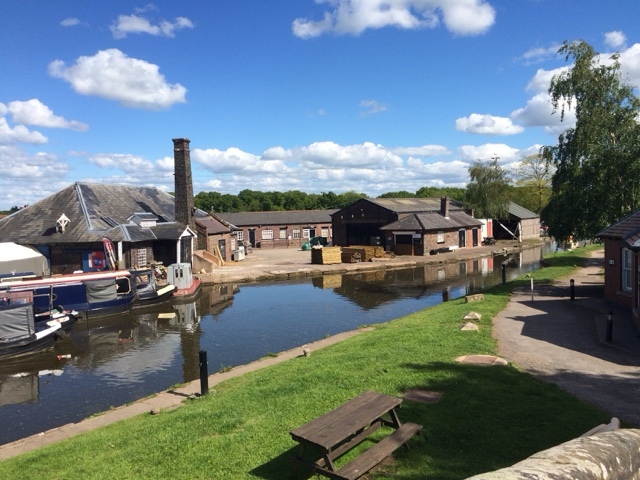 Tomorrow we plan to move off and following a brief visit to Tattenhall Marina for services we aim to stop near to Egg Bridge at Waverton. Last night it poured down, and it was still raining when we woke this morning. It was a flip of the coin whether to delay our departure for a day, but the forecast indicated improving conditions. So beneath leaden skies we pulled pins and set off for Beeston. We met a share boat at the nearby services where we both took on water, and thought that they might double up with us in the locks. They finished taking on water and were about 5 minutes ahead of us. 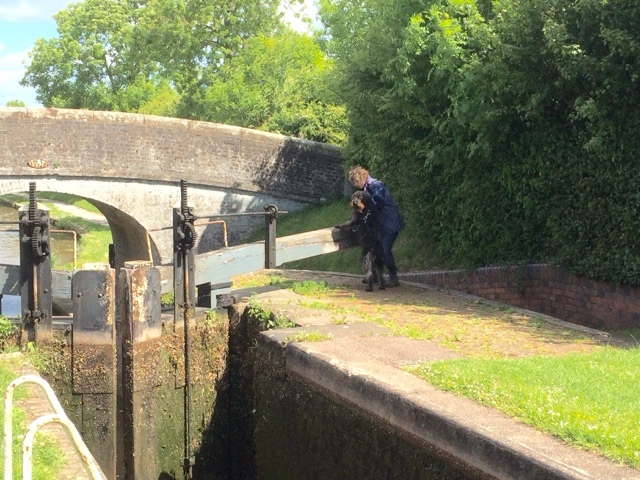 By the time we reached the Bunbury Staircase locks they were already descending. They claimed to have waited, likely story. Bunbury Staircase Locks and stable block. Nor did they wait down the rest of the flight. Obviously, water conservation was not high on their holiday agenda. 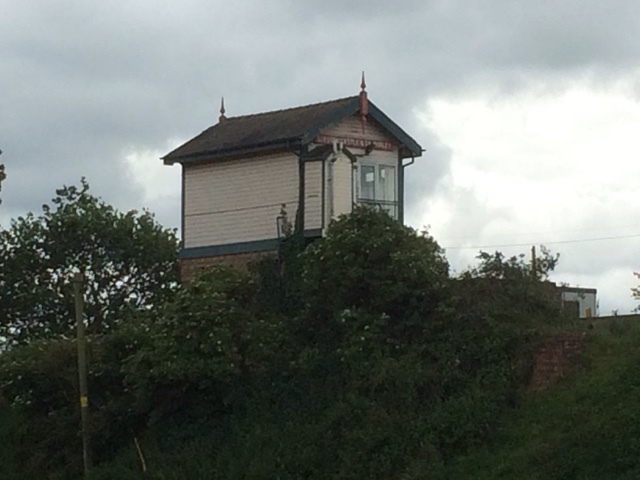 After navigating Beeston Iron Lock, which is clad with steel plates due to its bulging sides, we passed close to the West Coast Mainline, complete with old style signal box. 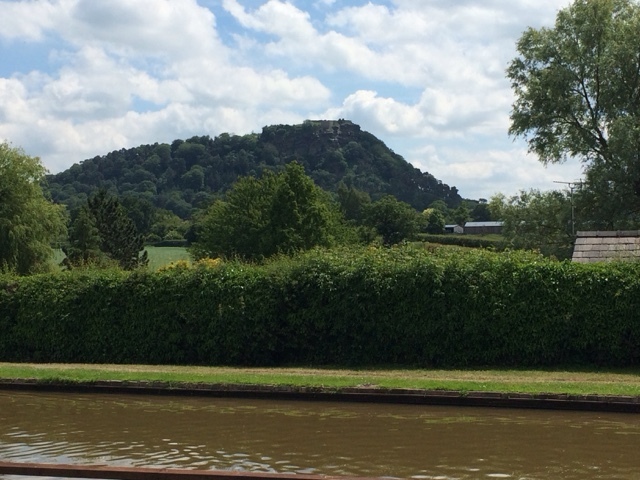 Beeston Castle and Taporley signal box. Just a mile further on we arrived at Wharton's Lock. Initially we planned to moor below it, but the spot above was more sheltered, so we stopped. 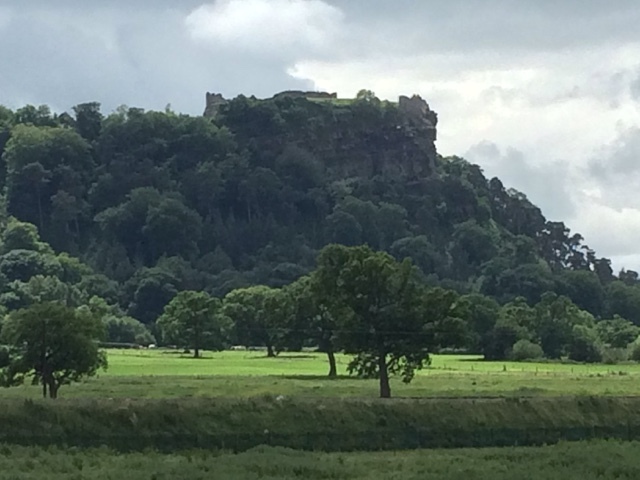 To the left we have good views of Beeston Castle, which we will visit tomorrow. After securing the boat we had lunch, then in the afternoon, walked to the bridge ahead where the Shady Oak P.H. is located. This is a dog friendly pub, so we stopped for refreshments before returning to the boat. During this time we got a closer look at the hill we have to climb tomorrow. It looks steep. We plan on staying here till Wednesday, or possibly Thursday, depending on the weather, and how much rest we need after our mountaineering excursion tomorrow. Awoke this morning to drizzly rain, but by the time we set off it was more a fine mist. Hurleston Junction was still busy with boat movements however. Once through the junction it was only a mile to our mooring spot, a couple of hundred yards prior to Barbridge Junction. Once secured we phoned Ye Olde Barbridge Inn, to reserve a lunch spot. It was as well we did as it is Father's Day tomorrow and they were very nearly fully booked. We will stay put till Monday when we plan to go as far as Beeston to visit the castle. As I write this the clouds have broken, and the sun is shining so not a bad end to the day. Mooring close to Barbridge Junction. 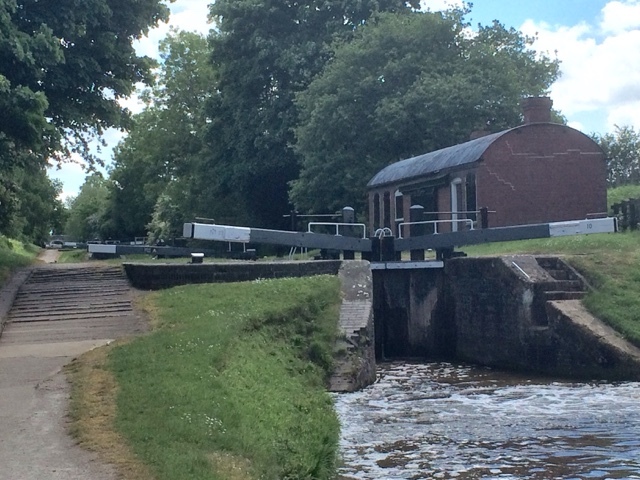 Today we walked to the junction and then left up the lock flight onto the Llangollen Canal. We wandered on for about a mile before returning. 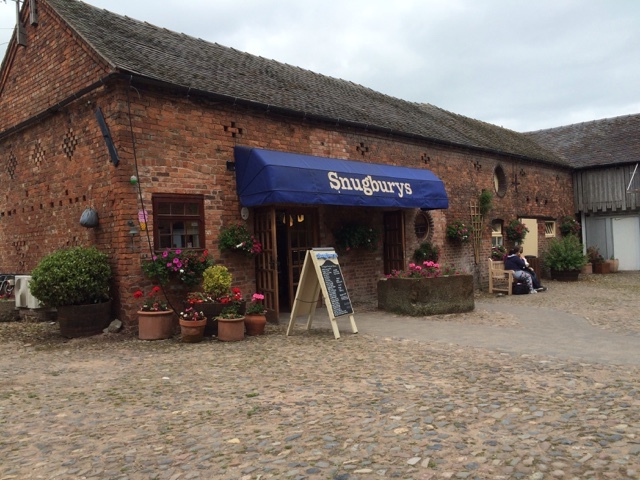 On the way back we took a short detour along the A51 to visit Snugbury's Ice Cream Parlour. They have an endless list of flavours to choose from. The only thing missing was the sunshine. Just two more days and summer will be over, the sun heading south, and winter on its way back. The furry crew member complained last time that he only got the dregs of the ice cream, so this time he got his own pot. Still planning to move one mile tomorrow, nearer to Barbridge Junction and our Sunday lunch venue. Conditions this morning were somewhat blustery as we departed Coole Pilate. On arrival at Hack Green Locks we found a short queue going both ways. Whilst waiting I read the information board at the locks, to find that Hack Green played an important role during the Second World War, as a radar station providing protection for the docks at Liverpool. We forget how far north we have come, and that Liverpool is not that far away. We descended through the pair of locks without incident. That's it for the easy narrow locks for a while, it's the heavy wide ones from now on. 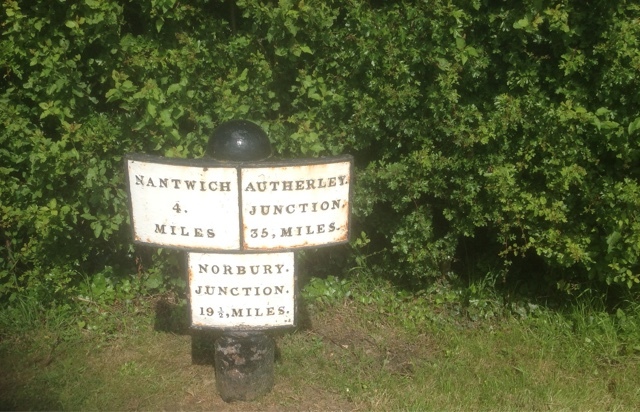 A couple of miles later we arrived at Nantwich. There is a small but bustling basin, with full services. We took on a tank full of water and visited the waterside cafe. We did not visit Nantwich town this time, we will save it for another day. Two more miles and we reached our destination, Hurleston Junction. 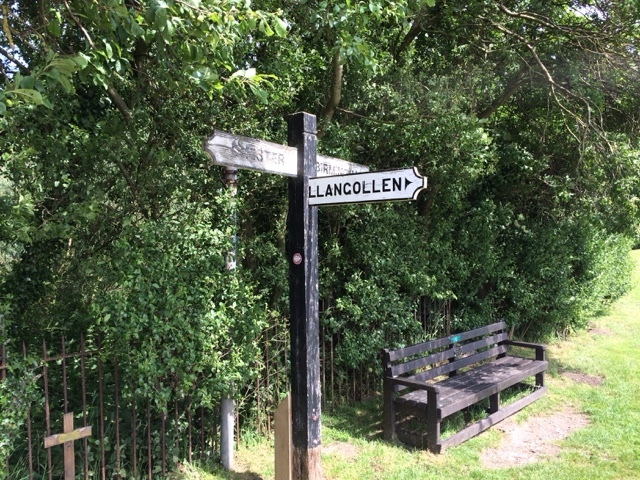 This is were the Llangollen Canal departs from the Shropshire Union heading off towards Wales. 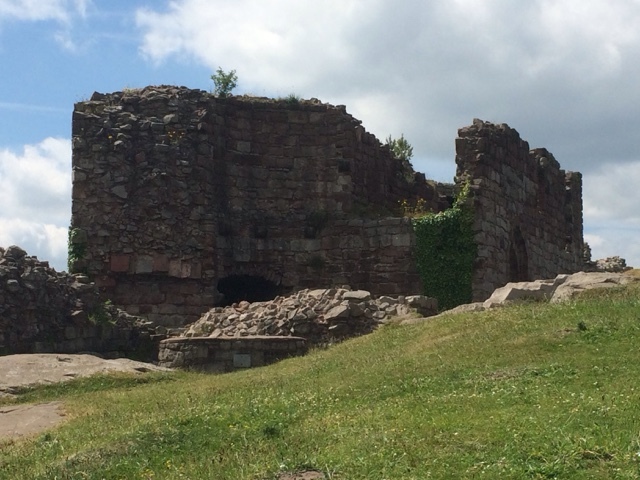 Our intention is to do this trip when we have finished in Chester and Ellesmere Port. 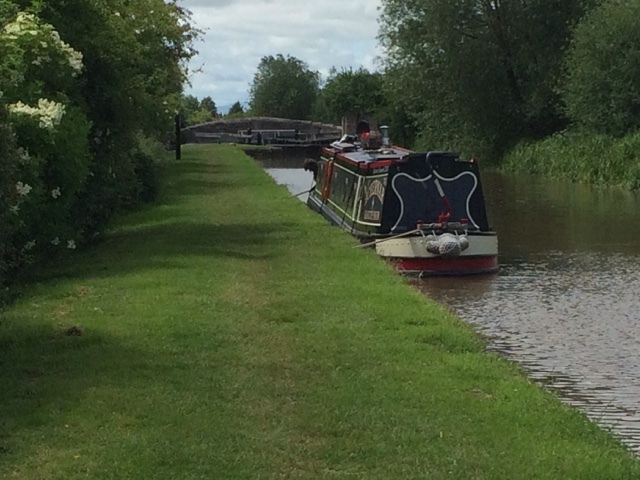 After securing the boat we walked ahead towards Barbridge Junction a mile and a half away. There are a couple of pubs here, and we wanted to check out a possible Sunday lunch venue. Ye Olde Barbridge Inn has got our vote. We will probably move forward nearer to this on Saturday. Middlewich Branch of the Shropshire Union Canal. 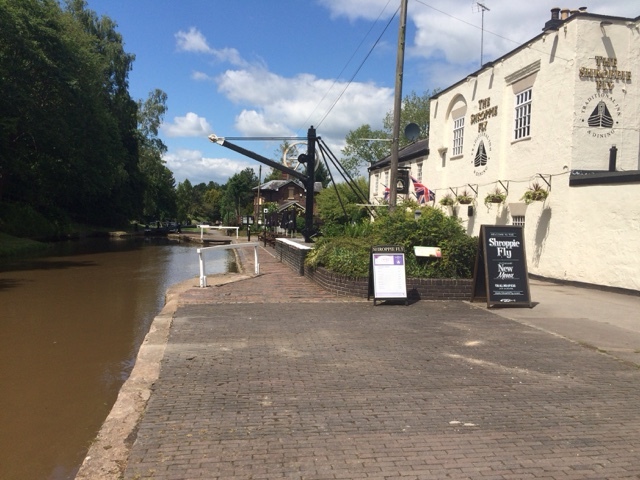 Barbridge Junction is where the Shropshire Union links up with the Trent and Mersey Canal at Middlewich. This will be our route back when we start to head south again for the winter. There is a canal and music festival at Middlewich this weekend, which may explain the heavy traffic over the last couple of days. Returning to the boat the weather has warmed up making for a pleasant evening, although the wind is still gusting quite strongly. Our spot at Hurleston Junction, with Oscar enjoying some playtime. The view across our bow last night. We have stayed put for a final day, to finish off a thorough cleaning of the cratch area and the engine room. 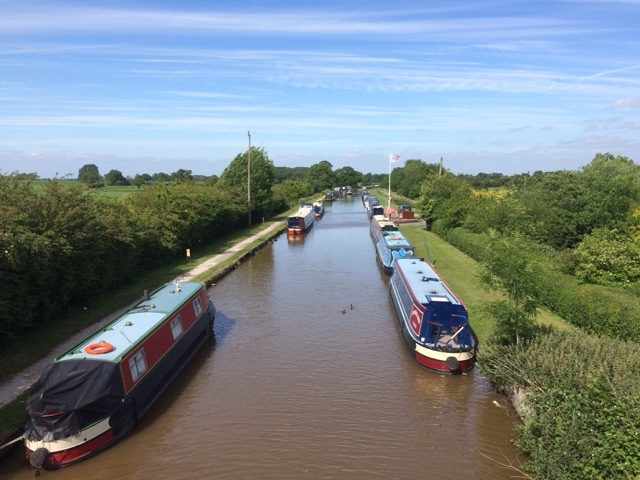 The forecast rain arrived early afternoon, so the plan is to depart in the morning with a brief stop at Nantwich, before finishing at Hurleston Junction where the Shropshire Union Canal meets the Llangollen Canal. Following breakfast we readied ourselves for the short two and a half mile trip to Hack Green Locks. We did not make it. After just a mile we passed a delightful mooring spot with picnic tables and extra wide towpath. It had just been trimmed by the strimming teams and so we pulled in and stopped for the day. After a brief rest for an hour or so we headed off on our walk. 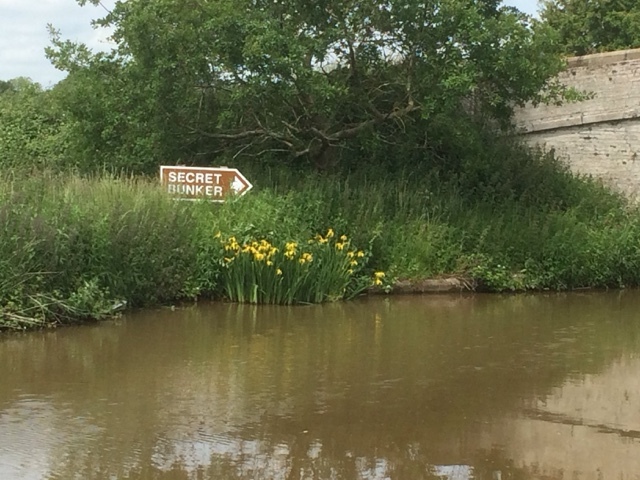 Approaching Hack Green a sign was spotted in the bushes pointing the way to a not so secret tourist attraction. 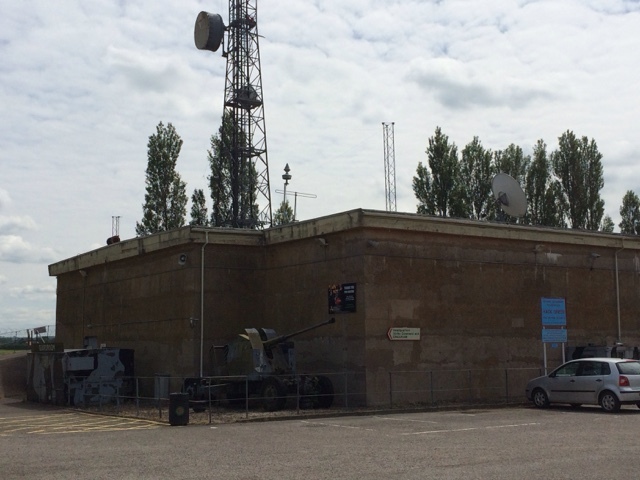 We went and had a look and found a large, above ground concrete building, a relic of the Cold War. I have to say that I doubt this building was even secret in its day. Entry to the above was over eight pounds each, and given that both myself and the crew have both worked in a real one during the early eighties, we decided against going inside. The establishment we spent time in was fully below ground, so unlike this one it must have been a really really secret bunker. Even so I suspect the locals knew it was there. I was not going to post the next picture as it requires some imagination on the part of the viewer, but yesterday at the Marina we were treated to another Cold War spectacle. The last remaining, airborne Vulcan bomber flew over the Marina on its way to an airshow. The sad fact is, that may have been the last time we see it fly, as it will be permanently grounded in the autumn due to safety reasons. 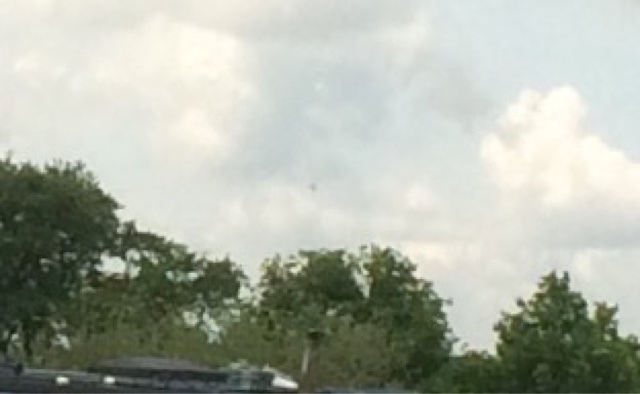 You may just see the dark shape an inch above the centre tree. For any interested in aviation stories if you haven't already, have a look at the account of Operation Black Buck. This involved a solitary Vulcan flying the then, longest bombing run in history, to bomb the airfield at Port Stanley in the Falklands. Apart from anything else, the refuelling method to get the Vulcan there and back, was an amazing feat in itself. 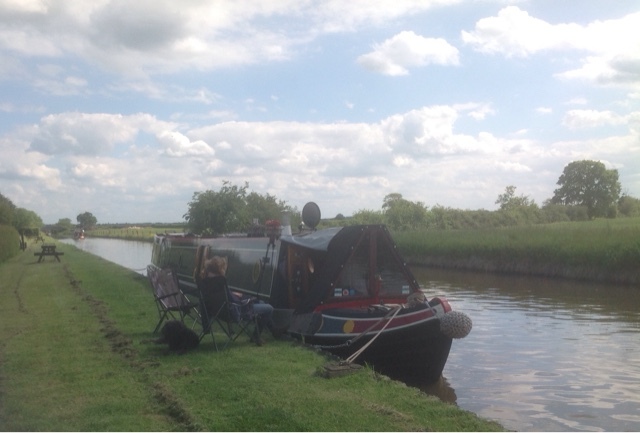 Once back from the walk we settled down for the day, enjoying the sun in comfy chairs on the towpath. We may move on tomorrow, or may stay another day, that's yet to be decided. Our mooring at Coole Pilate next to the milepost. Yesterday we had a plan. After spending an extra couple of days at the foot of the Adderley flight due to it being a picturesque and peaceful setting, it was time for us to leave. 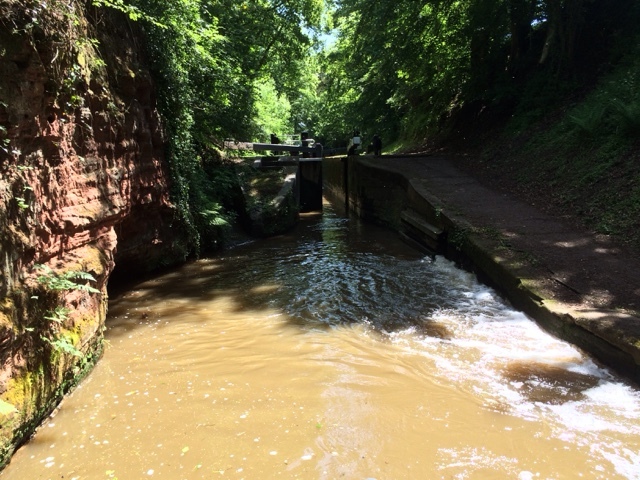 The plan was to descend 11 of the 15 locks at Audlem then stop for a day or two. 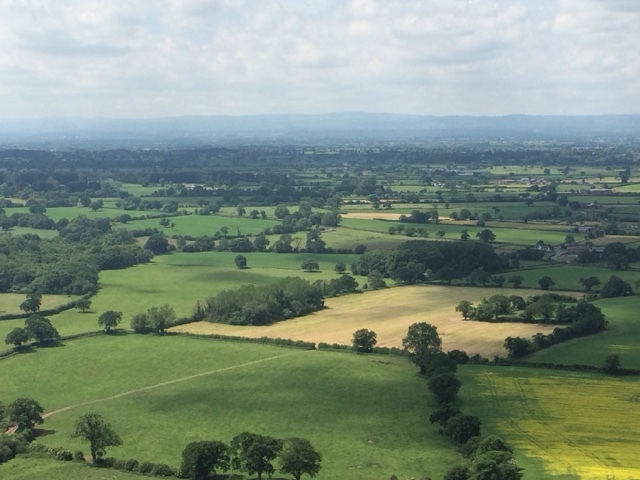 The picture above was the moment we passed from Shropshire into Cheshire and at this point all was well. At least we have reached the right county for our wedding date, it has only taken three months so far. We continued descending the flight, passing an example of a barrelled roof building, historically used by carpenters, stonemasons and blacksmiths maintaining the locks. You can just make out the number on the balance beam, number ten only, one more to go today, or so we thought. 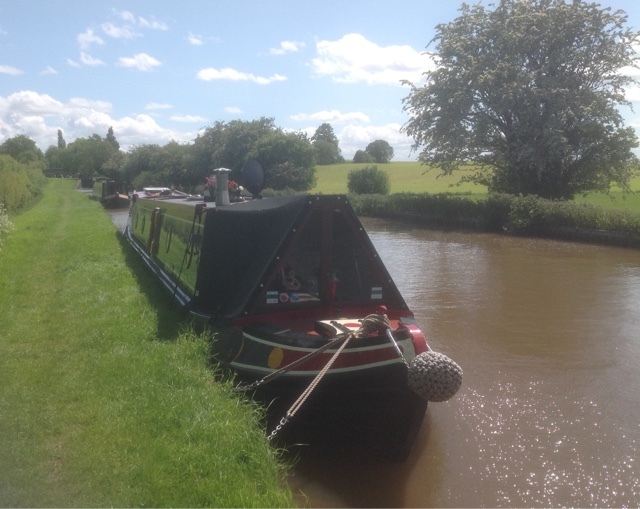 After the next lock we moored in the sunshine, and were ideally placed for trips into the village of Audlem. I was particularly looking forward to my tea. I was going to have a chicken kebab from the village takeaway, something I have not had for nearly a year. After securing everything away, and in preparation of a relaxing afternoon the crew drew to my attention a wet floor in the shower room. Further examination revealed that it was not the case, that I had splashed around excessively having a morning shower, but that we had a leak. It was a simple to reach joint in the plastic push fit plumbing that was seeping, but the system pressured by the water pump meant that a significant amount of water was collecting on the floor. Rather than the old fashioned brass compression fittings that could simply be tightened with a spanner or two, this new fangled push fit stuff requires a special key to unlock. A special key that I do not have in my toolbox. So with the system depressurised, we had no water, no toilet flush and a wet shower room. A few phone calls later and the staff at Overwater Marina informed us, if we got to them they would fix the problem. We set off once more. Goodbye to our nice sunny spot at Audlem, but more importantly goodbye to my chicken kebab. We passed the famous 'Shroppie Fly' P.H. which was historically a wharf and warehouse. The old crane still present at the front. Inside the bar is shaped like the bow of a narrowboat. We have eaten here a couple of times and it is also dog friendly. The ' fly ' relates to the so called fly boats, that used to travel the 80 miles from Ellesmere Port to Birmingham in a little over 24 hours. They used to travel day and night and required a regular change of horses. The fly boats were used to transport perishable goods so needed to operate to a strict timetable. Only three more locks and about half a mile to cruise before we arrived at Overwater. We had been directed to a berth and good to their word, a couple of hours later the leak was fixed. It took about 5 minutes with the correct tools, so a HEP2O key is now on my shopping list. Overwater Marina is a bit larger than our spot at Yelvertoft, but the layout is nice with islands in the centre which breaks up the boat park look. It also has a good set of services including a cafe and won Marina of the year 2015. Due to forecast rain over the weekend we have booked to stay here till Monday. 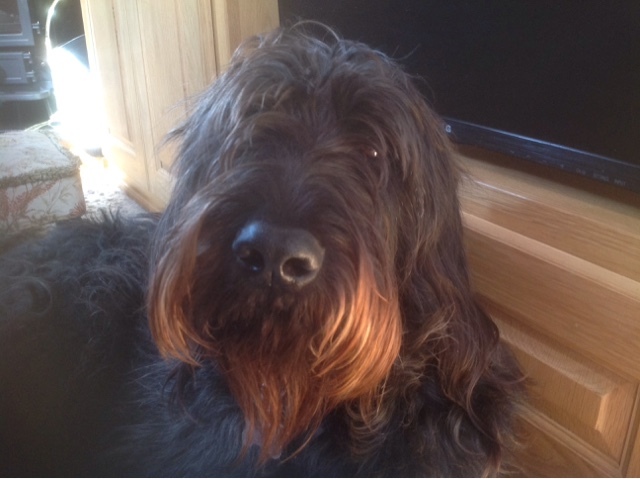 The furry crew member was not too impressed at having to do 15 locks instead of the planned 11 and thought that if he stared long enough he would get the comfy seat. He was wrong. Having spent a couple of days at Market Drayton it was time to move on. A local family of swans were there to see us off. 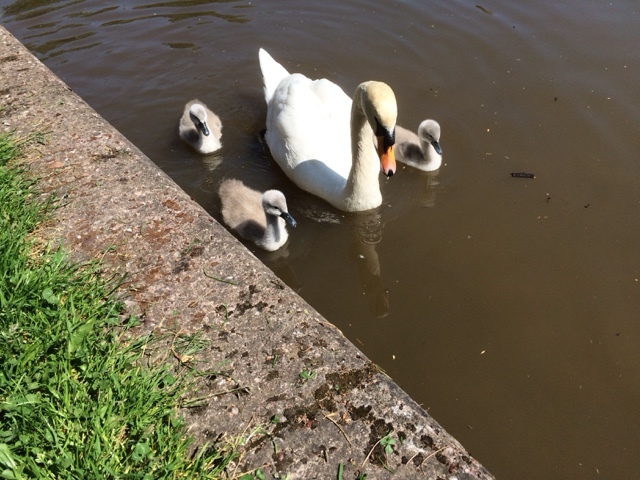 These are the first cygnets we have seen this year. Only a shortish hop today, to the village of Adderley. We set off at an early for us, 7.30 am topping up with water and emptying the holding tank. We now won't need services of any kind for at least seven days. At 10.30 we were at the top of the Adderley flight of locks. 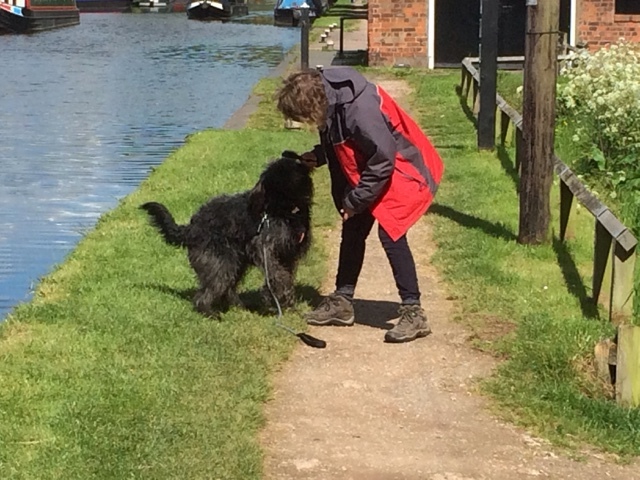 Five in total and each with a fairly fierce by wash. Progress through the locks is getting quicker, now that the four legged furry crew member, is learning how to open the lock gates. At the bottom of the flight was our mooring spot for the next couple of days. We arrived just as the wind was picking up so all in all, perfect timing. Our mooring spot at Adderley. Not long after stopping we got neighbours, but by Sunday we may be on our own again. It does not seem very busy at the moment. Summer certainly arrived this morning with not a cloud in the sky. We set off shortly before nine, Oscar wearing his sun hat for the day. 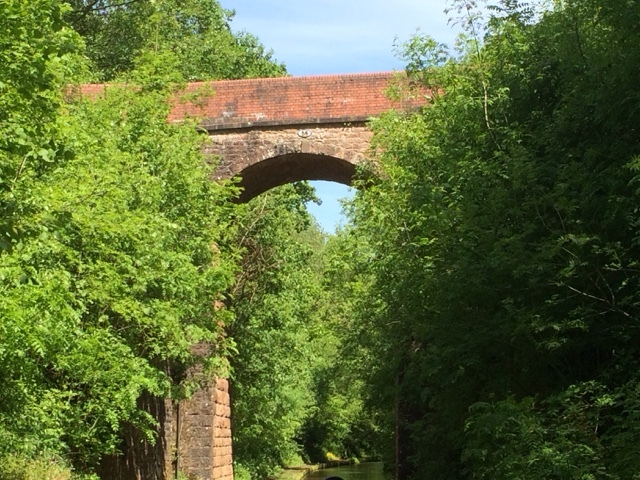 A mile later we were passing under High Bridge with its unusual masonry strut to carry a short telegraph pole. Passing Anchor Bridge and its associated public house we noted the moorings here were very nice and with refreshments close by its the perfect location. The prime spot was currently taken by another blog writer, nb Armadillo who can be found in my blog list. 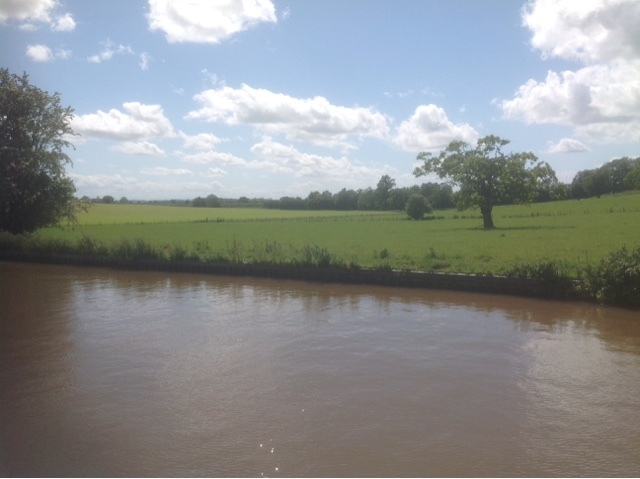 Once we had passed over the Shebdon Embankment we crossed from Staffordshire into Shropshire. 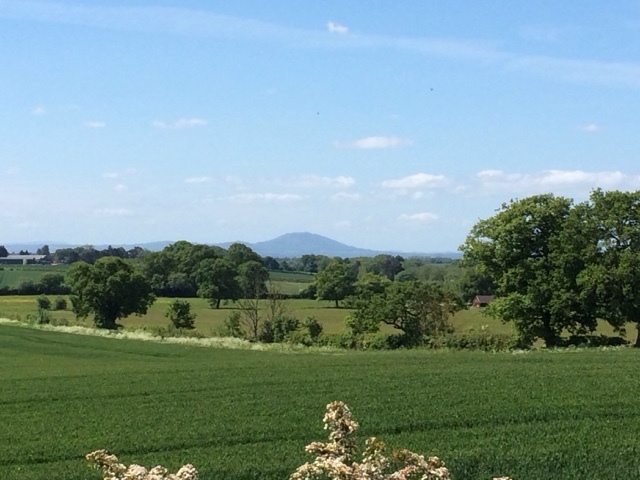 Looking out to the West we could see the Shropshire plain with its solitary hill ' The Wrekin ' some 15 miles away. We entered Woodseaves Cutting, 100 feet deep in places, and very steep sided. There were strange looking ferns and mosses clinging to the sandstone. Very narrow but with a few passing places, we were fortunate not to meet any on coming boats. I would not want to have been one of the navvies having to dig my way through that. High arched stone bridges in Woodseaves Cutting. 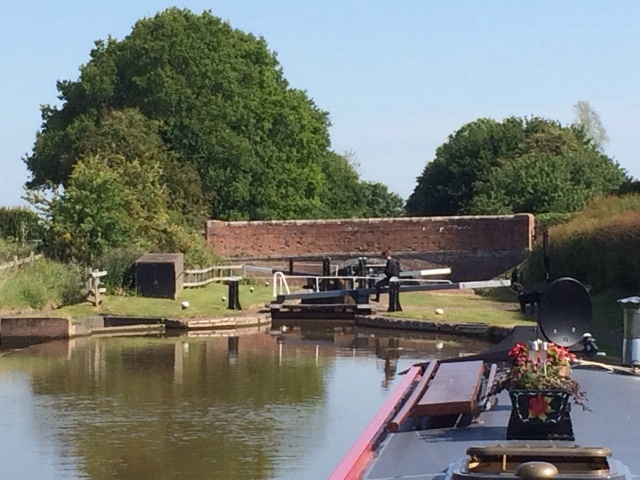 After emerging from the depths of what seemed like a tropical forest we arrived at Tyrley Locks. There were five to navigate, before reaching the bottom of the flight, and the final run into Market Drayton. I nearly got wet standing on the back with this one. 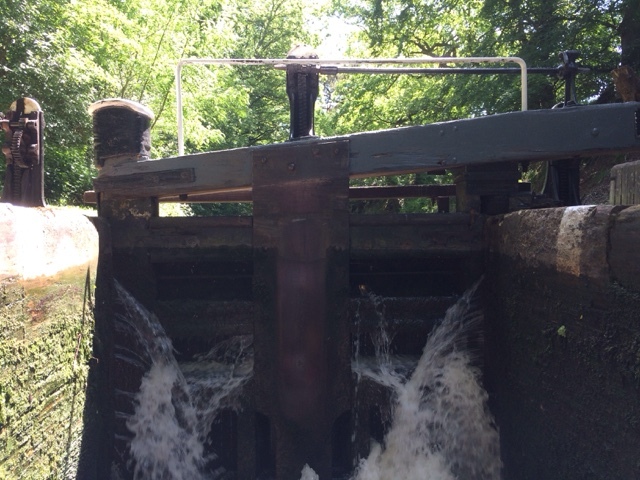 On leaving the bottom lock there is a very strong by wash as can be seen from the turbulent water on the right of the photo. A shield has been placed over it presumably to prevent it washing away the sandstone as can be seen on the left, where a small hollow has been cut into the rock. As we passed out of this final cutting it felt as if we were being watched. 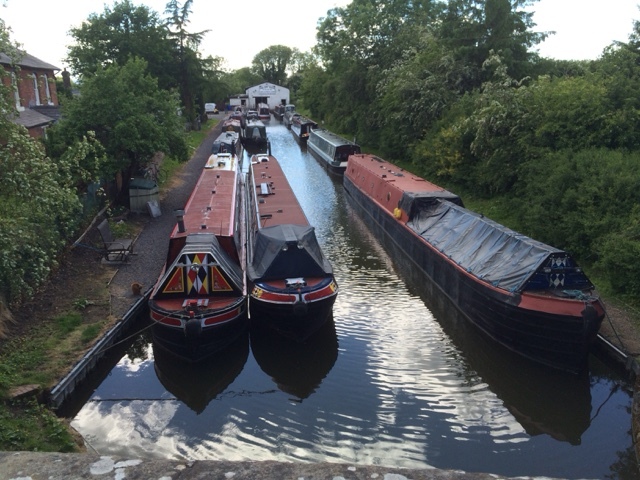 A mile later we arrived at the visitor moorings for Market Drayton. We will probably explore the town tomorrow and then depart on Saturday as the mooring here is for 48 hours only. 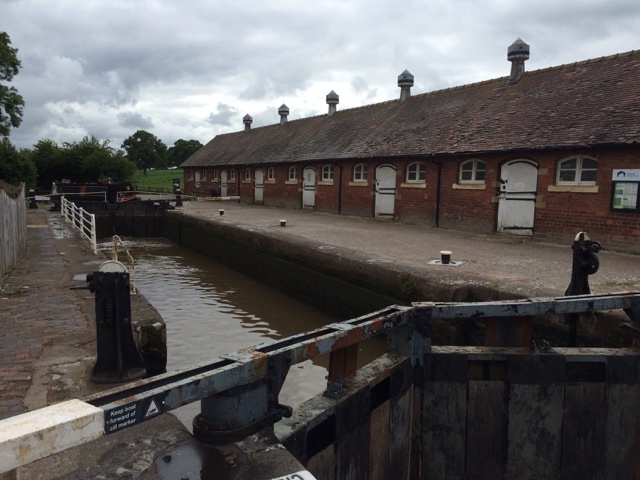 We have been told of some good rural moorings by the next flight of locks at Adderley, only two miles away. We stayed at Brewood an extra couple of days to sit out the forecast high winds and rain. We must have been located to miss the worst of it however, it was worth the wait. Our journey today was going to be conducted in two legs. First to Wheaton Aston for services. We had a short wait at the only lock of the day, then we arrived at the village. There is a garage here by the road bridge which sells red diesel, reportedly the cheapest on the cut. Today it was 58p a litre. We also filled with water, and whilst waiting the crew decided the four legged member was looking untidy, so out came the brush at which point the wrestling match commenced. Once replenished with diesel gas and water we resumed our journey. On route we passed through a few more deep cuttings, where the trees now in full leaf provided a green roof over the canal. We also decided to check out potential mooring spots which we could mark in our book for future reference. We found a nice rural location near the village of Church Eaton where we could get right into the bank. 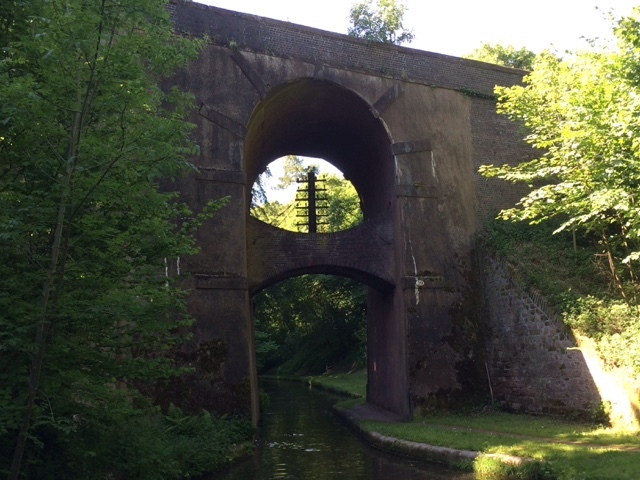 A mile or so further on we entered Cowley Tunnel, however at only 81 yards it is more of a long bridge. We passed through the village of Gnosall, which is where we planned to stay had we not opted to spend a week at the Stafford Boat Club. We made the right choice. After Gnosall it was only two miles further to our planned stop. We traversed the Shelmore Embankment which runs for almost a mile. Heavily wooded on both sides it is a substantial feat of engineering, considering it was built without modern machinery. Telford, the famous canal engineer failed to see the completion of this canal due to repeated collapses of this embankment. 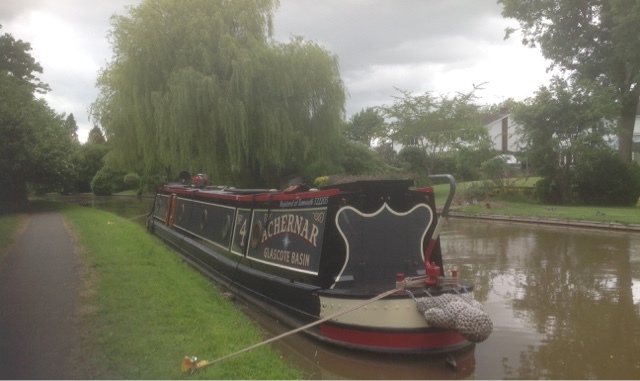 At the northern end of the embankment we reached our destination of Norbury Junction and Wharf. 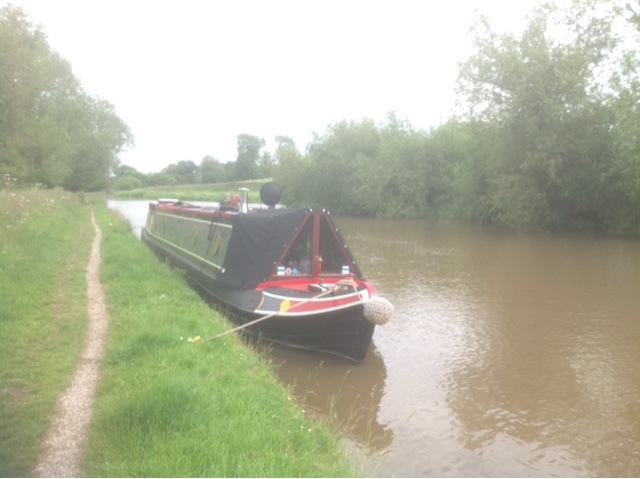 Views from our mooring at Norbury Junction. After lunch we took a short walk to have a look at the wharf and maintenance yard. At the junction only a short arm remains of the Newport branch. 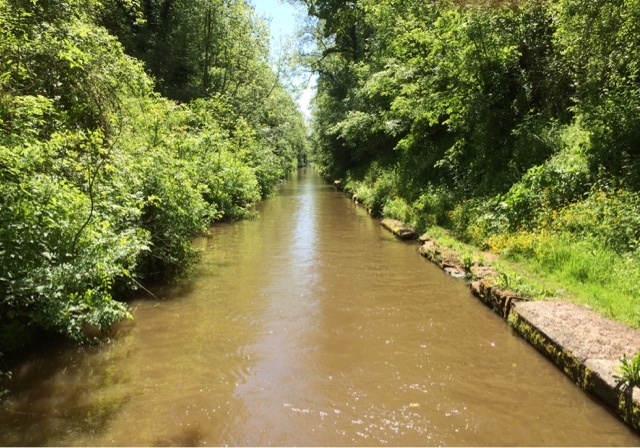 Although much of this canal branch is filled in the route is largely intact and therefore restoration is a possibility for the future. It currently serves as a private mooring and boatyard services. Short arm of the Newport Branch. The diesel here is a penny a litre more, but there is a chandlers and shop here. 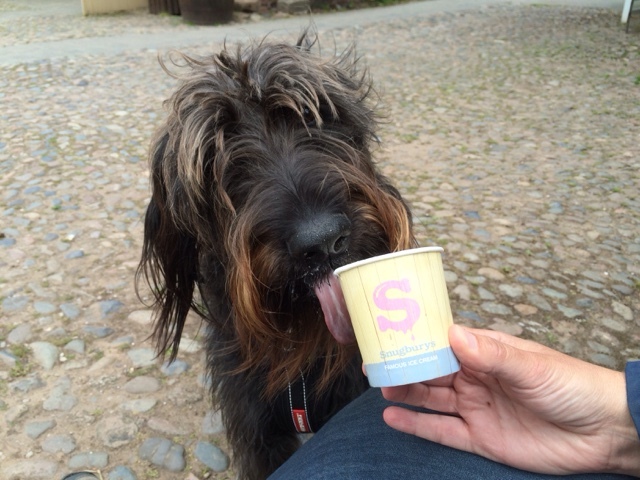 The warm weather has well and truly arrived so we purchased ice creams to cool down. We are only staying here for one night then it is on to Market Drayton.